I'm using a very old keyboard that doesn't have a physical Windows key — it does have a 5/180° connector and an AT/XT switch on the back — but I don't want to completely miss out on the functionality of the Windows key. Is there some group of keys in Windows 7 Pro that simulates Win when used together? In other words, I want to be able to take any key combination that uses Win, mentally remove Win and drop in this other group of keys and have the original combo work. If no such combination exists, how can I create one? I know that I could just plug in a newer keyboard that has a Windows key, but the whole point of this question is to avoid that. None of the existing windows-key questions seem to address this; the closest is this one, but it doesn't actually say how to create the mapping. This is for my work computer, so "install this utility/plugin" isn't a good option for me. Feel free to answer with those for the benefit of others, though. 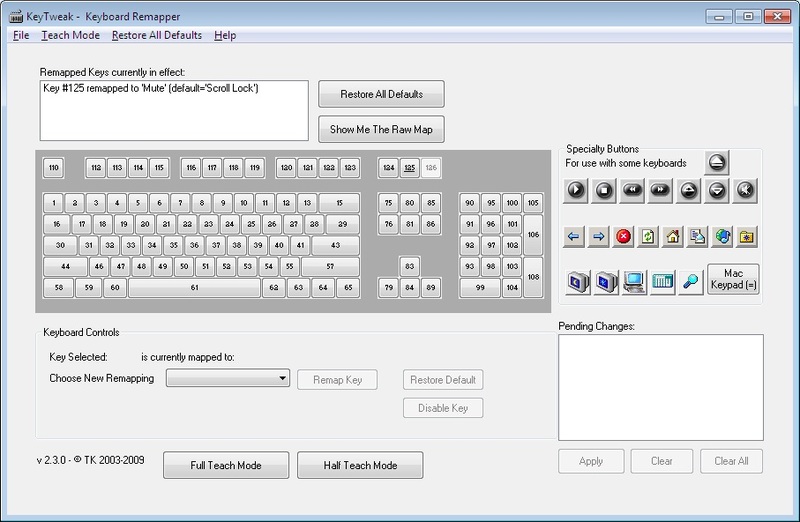 Remap your capslock key with a quick registry hack? The Caps lock key is worthless. CTRL-ESC brings up the Start Menu. Unfortunately, it does not allow the other windows key shortcut functions. For instance CTRL-ESC-Pause/Break will not bring up system properties. And CTRL-ESC-R will only bring up Run if you release CTRL-ESC before striking R, and then it'll only work if there aren't any entries in your Start Menu beginning with "R". You could create a custom keyboard layout with the key remapped. Microsoft Keyboard Layout Creator may be able to do the job. You can remap any key to be a Windows key using KeyTweak. It's just a GUI interface to the registry, so does the same thing as what Zoredache suggests in his answer. In Windows 10 the keymap suggested in the accepted answer maps Z and M to B and maps B to Z. It was funny until I realized my username has an "M" in it. Thankfully Win10 has the on screen keyboard option in the accessibility options during login, but this wouldn't show up for the "Run as administrator" dialog. AutoIt does not need to be installed on a computer for it to run. It can be compiled into an executable that contains the interpreter so that it can run on any windows machine. You also don't need to install it to write and compile, you can simply use the zip download. Not the answer you're looking for? Browse other questions tagged keyboard keyboard-shortcuts windows-key or ask your own question. How to dock a window to an inside edge of a dual-monitor setup without a Windows key?